Pete is recognised as the UK’s leading comedy magician. He starred in BBC1’s prime-time Saturday night programme ‘The Magicians’. Magician and comedian Pete Firman first burst onto our television screens as the cheeky Northerner 'Tufty' in Channel 5’s Monkey Magic. Since then he’s appeared on Sky's Secret World Of Magic and amazed viewers with his ability to perform disgusting tricks with animals and big spiky things in Channel 4's Dirty Tricks. 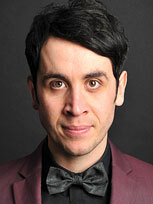 He’s perhaps best known as a regular on BBC One’s Saturday night show, The Magicians. Other TV credits include Let’s Sing & Dance for Comic Relief, The John Bishop Show, Comedy Rocks with Jason Manford and The Sarah Millican Television Programme. He’s performed alongside Rihanna in For One Night Only, presented gameshows and appeared on Celebrity Mastermind (specialist subject, appropriately - The Life of Tommy Cooper.) 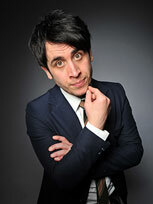 He also presented his own show, Pete Firman’s World of Magic for BBC Radio 4. Pete’s Edinburgh debut show Hokum led to performances at the prestigious Just For Laughs Comedy Festival in Montreal, where he headlined the Britcom showcase and performed in the televised gala. He has returned to Edinburgh every year since and has toured the UK 6 times with his one-man theatre shows. His first book - Tricks To Freak Out Your Friends – is popular in the UK and USA with readers who want to learn how to amaze their friends. Pete combines traditional tricks (often with an ironic twist) with off-beat humour and a sense of unpredictability. A naturally gifted performer and magician, Pete has been credited with helping reinvent magic taking it from its dated showbiz past to a new audience more familiar with standup comedy.